The sparkling blue eyes with the impossible eyelashes….the creamy skin…the crazy eyebrows…the apple cheeks…the perma-grin…this is how I always want to remember her. She was exceptionally, ridiculously adorable. Maddie was such an incredibly beautiful child and is still a beautiful spirit. And I thank you for sharing your Maddie Moo with us. 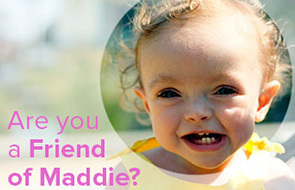 We miss you, beautiful little Maddie. sending you lots of love…..
Beautiful, beautiful, little Maddie,,,,sending lots of love to you and Mike, Heather,,,today and everyday. She’s so beautiful. I’ve had you, Maddie, Mike and Annie in my thoughts even more than usual over the past few days. Hugs. She’s beautiful. Thinking of you guys – and sending comforting thoughts from the East Coast. She is beautiful! That smile makes me smile! Continuing to think of your entire family. This photo always makes me smile. Those eyes and that smile are what I picture when ever I think about her. Gorgeous and full of light. Much love and many hugs to all of you. A perfectly gorgeous picture of such a special girl. Sending lots of love your way. I’ve always thought her eyebrows were fantastic! She had such a beautiful spirit. A beautiful girl! You,Mike,Annie and Rigby are all in my thoughts. She is the most beautiful, radiant angel there ever was! Thinking of you all today. Thank you for sharing this picture. It makes me smile, yet tear up at the same time. She was just beautiful and oh so precious. I always love how in pictures her even her eyes smiled when she laughed. She was a beautiful, happy girl who should have had a lot longer. Thinking of you guys. I still remember, who could ever forget? She was such a spark and still continues to be. Sending you love during these darker days. RIP precious little angel, you are loved and missed! The word that comes to mind whenever I see a picture of Maddie is ethereal. I have never used that word to describe anyone else, but it’s the only word I can think of to describe Maddie’s exceptional beauty! Such a beautiful, beautiful child – exceptionally beautiful, inside and out. Love to you, Mike, and Annie. You’re in my thoughts and prayers. Of course you would. She’s beautiful in this pic.